Strolling through Nha Trang, it is not difficult to notice the huge ancient architectural complex in the northern part of the city. Embodying the cultural and historical values of Cham Kingdom, this relic is definitely one of the must-go places on the list of top things to do in Nha Trang if you have ever planned to visit this city. Join a history expert from Inspitrip to uncover interesting historical facts of Ponagar Tower – one of the most unique heritages in Khanh Hoa Province and get some tips for an amazing experience that you should not miss out. Located on the top of Cu Lao mountain near Cai river entrance, Ponagar Tower is part of the greatest historic complexes in the old Champa territory with the architecture influenced significantly by Hinduism. The whole architectural complex was estimated to be constructed between the 8th and 13th centuries in order to worship Yan Po Nagar – the country goddess, who was identified as an affiliation of the Hindu goddesses: Bhagavati and Durga, and called Thiên Y Thánh Mẫu in Vietnamese. This has become a unique example of a collective culture – the Champa, created by the harmony between two cultures, the ancient Vietnamese and Indian. The complex was built facing the sea to the east and seven-degree northward with three levels of architecture. On the top level, there are two rows of temple towers surrounded by walls along with the remains to the west and south. Ponagar Tower is the main tower on the first row from the north to south, which also contains a small temple to dedicate to the first-melon-planting couple according to a myth. An interesting fact is that the image of the goddess in the temple is still controversial among historians till now. Parmentier – a famous French art historian in his study (1909) indicated that the tympan carved with the image of Shiva dancing between two Brahmins while a French researcher (1963) observed it as the image of Durga. Rumour has it that the conclusion of whether the temple worships Shiva or Durga, it will be based on the gender of the god. In Hindu mythology, Shiva is the third god in the Hindu triumvirate who are responsible for the destruction of the world while Durga is the warrior goddess who combats evils and protects the universe from demonic forces. For me, whenever I come to a new place, I am so eager to find out the legends, the story behind it and grab every opportunity that comes up to explore that destination. Ponagar Tower has many versions of its origin which are still being told to the young generation till now. One of those was the Cham Islamic legend on the great goddess Amuhhekat who created the universe with 12 suns and 12 moons. Angel Cu was one of her assistants to bring lights and life to the world. After the world was established, Angel Cu’s daughter, Po Inu Nagar built the Champa Kingdom, appointed the first king, and created a civilization in this area. This tower was built in order to worship the greatness of her and to show the locals’ gratitude towards the woman who had dedicated her life towards creating a prosperous kingdom. Another story about the origin of this kingdom was modified by Dai Viet people (also known as ancient Vietnamese). In the 17th century, under the control of the Viet, Po Inu Nagar was referred to Thiên Y Thánh Mẫu who was sent from the empyrean and raised in a local family before getting married to the prince and teaching the locals how to do farming, sculpture and various forms of art. However, no matter how many affiliations and legends the god has, the original idea about her still stays the same as the goddess of culture and civilization creation. Ponagar Tower Festival takes place from 20 to 24 March in Lunar calendar annually. In this festival, due to the traditional religious practices and folk beliefs, everyone in the area, including both the locals and tourists, will gather around at the tower to pray and watch the dance performances and rituals of the ancient Cham people. Furthermore, the dancing shadow is also popular for the participation of an all Champa dance team. The famous dances of the Cham people, such as the water berths love, the sound of Saranai, Apsara and drum Ghi-Nang, are all performed during the festival, thus are considered a unique art heritage of the city. Therefore, if you are looking for the special old traditions of this area, the festival would be your best chance to discover its interesting culture and people. The temple’s central sculpture is carved of a 1.2m tall stone as the image of the goddess Yan Po Nagar whose ten hands holding many symbolic items while wearing small cloth and sitting cross-legged. Another statue of the goddess, which is found in the triangle pediment above the temple entrance, is described as a goddess who stands on a buffalo with four hands holding a hatchet, a lotus and a club. Vietnamese historians claim that this particular form of sculptures is categorised as Tra Kieu style in Cham art, which was very popular by the end of the 10th century and the beginning of the 11th century. These types of art can also be found in a number of architectural towers in the surrounding areas, such as Poshanu Tower in Phan Thiet. 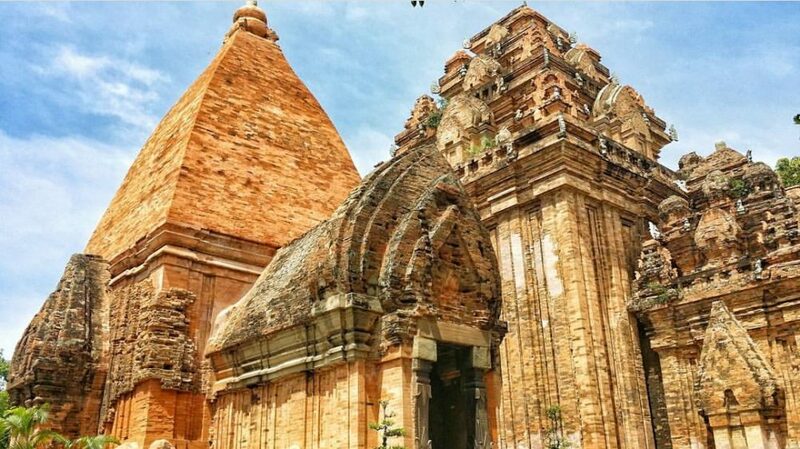 If you are interested in finding out more about the ancient culture of Cham people, you can just plan a day trip to Poshanu Tower – one of Mui Ne’s most famous attractions, which is only 2 to 3 hours away by bus, train or car from Nha Trang. The whole complex is located approximately 3km to the north of Nha Trang city and takes only 8 minutes to get there from the city centre by car. You can just grab a traditional taxi or Grab (a similar service to Uber in Vietnam) with a very cheap price. 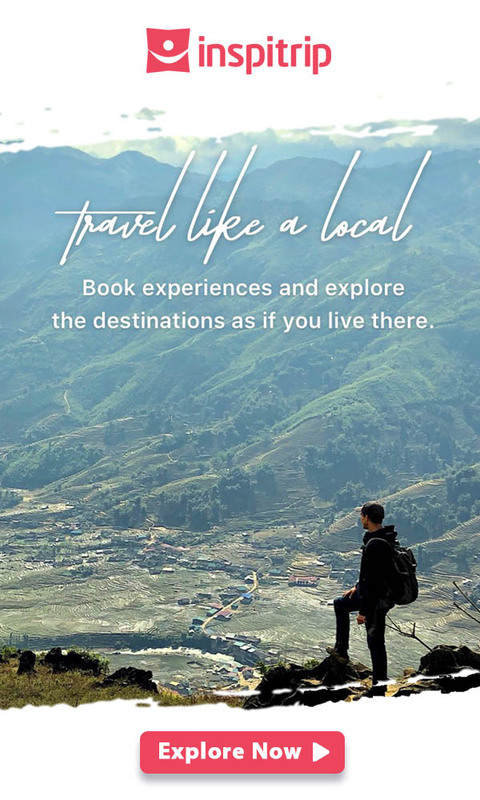 However, if you are more like a rambler, you should take the beautiful 30-minute walk via Tran Phu bridge and enjoy the cool breezes from Nha Trang beaches. There may be many things to do in Nha Trang, but Ponagar Tower stands out among the top attractions as it plays a critical role in preserving cultural values by leaving the footprints of Champa’s culture, where people shared different folk beliefs and had diverse religious practices but succeeded in keeping it peaceful under the glorious dynasty of Cham people. All in all, any trip to Nha Trang will not be complete without an exploration of the history and art culture of this beautiful coastal city. Don’t miss out the special adventure with a wide range of activities handcrafted just for you. Book your Nha Trang city tour online for top things to do in Nha Trang with Inspitrip from today!